There is little doubt that new mothers understand the benefits of breastfeeding, yet the UK remains at the bottom of the “league tables” in terms of the numbers of new mums who take up breastfeeding as well as the high level who stop soon after they have started. Priory Group consultant psychiatrist, Dr Kathryn Hollins, a UK expert in parent and child mental health, believes that to redress the balance, new mums need to be gently encouraged to explore all reasons as to why breastfeeding might not be working for them – and that an excessive amount of pressure, although well-intentioned, from health professionals and peers may do more harm than good. Dr Hollins comments; “I am convinced that many mums would be breastfeeding their babies happily and for longer if early help from professionals and experienced mothers was available at the exact moments when mums are faced with a screaming, hungry baby who hasn’t quite worked out how to ‘latch on’. Practical help and emotional support is needed now. In the UK this doesn’t usually happen. We set mums up to ‘fail’. “It’s not uncommon for pregnant women to feel ambivalent towards, or against, breastfeeding. The key is to be courageous and ask, ‘what are the reasons behind my negativity?’ As parents we frequently endure emotional discomfort on behalf of our children; breastfeeding is important enough to mean it’s worth working out your reasoning, despite the discomfort it may cause you. For example, for some, the bodily changes of pregnancy and the physical closeness of breastfeeding may feel unbearable perhaps due to an eating disorder history or other past issues. 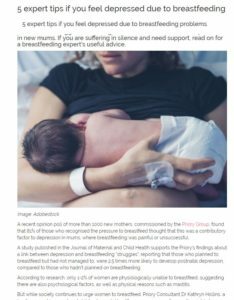 Echoing such concerns, an opinion poll commissioned by the Priory Group, amongst more than 1,000 parents from across the UK, found that 81% of those who recognised this pressure to breastfeed thought that this was a contributory factor to depression in mums, where breastfeeding was painful or unsuccessful. A study published in the Journal of Maternal and Child Health supports the Priory’s findings about a link between depression and breast feeding “struggles”, reporting that those who planned to breastfeed but had not managed to, were 2.5 times more likely to develop postnatal depression, compared to those who hadn’t planned on breastfeeding. According to research, only 1-2% of women are physiologically unable to breastfeed, suggesting there are also psychological factors, as well as physical reasons such as mastitis. But while society continues to urge women to breastfeed, women are frequently unable to access the emotional and practical support necessary to achieve this goal. Dr Hollins adds: “We know that once mum and baby are in the ‘groove’ of breastfeeding, it can be an immensely enjoyable time of intimacy and connection. “I would therefore recommend to any new mum to proactively find out about breastfeeding support in her area, including breastfeeding cafes and drop-ins. It’s also vital to talk about breastfeeding struggles and not to be afraid of asking for help, whether from your midwife, GP or health visitor – or even being brave and requesting more specialist advice and support. There are national and local breastfeeding helplines, online support, face to face peer support groups or drop in sessions to help you with any breastfeeding problem, big or small. Getting help straightaway can transform you and your baby’s experience into an enjoyable one for you both. Let your midwife or health visitor know you are struggling with feeding and arrange to meet with them. Find out about local support available with breastfeeding and bottle-feeding and consider meeting other mums locally with whom you can share the ups and downs of motherhood. If you have a partner, a supportive mother, sister or friend, let them know what is happening and let them support you so that you can focus on making this work. You need looking after so you can feed your baby, because getting feeding going is exhausting and time-consuming. Please get help for your mental health if you feel low, anxious, scared or overwhelmed by feeding or other issues during motherhood. Have trust that it can be different and don’t let shame or fear mean that you suffer alone. Think about who you feel able to talk with first. It may be family, one of the helplines above, your GP, or your health visitor. You may like to ask about parent-infant psychotherapy if you are struggling with bonding with your baby or you may want to ask to be referred to a perinatal mental health team for any mental health problem during pregnancy or early motherhood.